There have been several attemps made to the appreciation of remote sensing and GIS for the study of vectors, biodiversity, vector presence, vector abundance and the vector-borne diseases with respect to space and time. 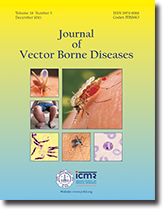 This study was made for reviewing and appraising the potential use of remote sensing and GIS applications for spatial prediction of vector-borne diseases transmission. The nature of the presence and the abundance of vectors and vector-borne diseases, disease infection and the disease transmission are not ubiquitous and are confined with geographical, environmental and climatic factors, and are localized. The presence of vectors and vector-borne diseases is most complex in nature, however, it is confined and fueled by the geographical, climatic and environmental factors including man-made factors. The usefulness of the present day availability of the information derived from the satellite data including vegetation indices of canopy cover and its density, soil types, soil moisture, soil texture, soil depth, etc. is integrating the information in the expert GIS engine for the spatial analysis of other geoclimatic and geoenvironmental variables. The present study gives the detailed information on the classical studies of the past and present, and the future role of remote sensing and GIS for the vector-borne diseases control. The ecological modeling directly gives us the relevant information to understand the spatial variation of the vector biodiversity, vector presence, vector abundance and the vector-borne diseases in association with geoclimatic and the environmental variables. The probability map of the geographical distribution and seasonal variations of horizontal and vertical distribution of vector abundance and its association with vector-borne diseases can be obtained with low cost remote sensing and GIS tool with reliable data and speed. Background & objectives: Artemisinin was first extracted from the herb Artemisia annua which has been used for many centuries in Chinese traditional medicine as a treatment for fever and malaria. It has been given the 2011 Lasker-DeBakey clinical medical research award. In this paper, knowledge map of artemisinin research was drawn to provide some information for global researchers interested in artemisinin and its relevant references. Methods: In this work, bibliometric analysis and knowledge visualization technology were applied to evaluate global scientific production and developing trend of artemisinin research through Science Citation Index (SCI) papers and Medline papers with online version published as following aspects: publication outputs, subject categories, journals, countries, international collaboration, citations, authorship and co-authorship, author key words and co-words analysis. The Thomson Data Analyzer (TDA), Netdraw and Aureka software were employed to analyze the SCI as well as Medline papers data for knowledge mapping. Results: Global literature of artemisinin research has increased rapidly over the past 30 years and has boosted in recent years. Seen from the statistical study in many aspects, Pharmacology & Pharmacy, and Chemistry are still the main subjects of artemisinin research with parasitology and tropical medicine increasing quickly. Malaria Journal and American Journal of Tropical Medicine are top productive journals both in SCI and Medline databases. Quantity and quality of papers in US are in a leading position, although papers quantity and active degree in developing countries such as P.R. China, Thailand and India are relatively high, the quality of papers from these countries needs to be improved. New emerging key words and co-words remind us that mechanism of action, pharmacokinetics, artemisinin-based alternatives, etc. are the future trends of artemisinin research. Conclusion: Through bibliometric analysis the development trends of artemisinin research are predicted. With further development of artemisinin research, it is presumed that scientists might concentrate mainly on the synthesis of new compounds with activity, action mechanism, new artemisinin-based combination therapy regimens, etc. Background & objectives: Indigenous larvivorous fishes bear potential for regulating vector mosquitoes through trophic interactions. The mosquito prey preference of five indigenous larvivorous fishes in the presence of alternative food items was assessed to highlight their use in mosquito vector management. Methods: Laboratory experiments were carried out using the larvivorous fishes Ambassis (=Chanda) nama, Parambassis (=Chanda) ranga, Colisa fasciatus, Esomus danricus and Aplocheilus panchax, as predators and IV instar Culex quinquefasciatus larvae as target prey. Mosquito prey preference of these fishes in the presence of chironomid larvae, tubificid worms and artificial fish foods, in varied proportions, were assessed using preference index. Results: The fishes consumed considerable amount of mosquito larvae both in absence and presence of alternative food items. However, the positive selectivity for mosquito larvae at all densities were significantly (p <0.05) affected by the alternative foods. The chironomid larvae and tubificid worms were consumed proportionately higher than expected (p <0.05), while the artificial fish food was consumed at lower than expected proportions (p <0.05). The niche overlap was significantly similar among the fish species suggesting likeliness in predation pattern and prey preference. Interpretation & conclusion: The results reflect that the alternative food items influence the mosquito prey selectivity and thus the efficacy of indigenous larvivorous fishes. While use of these fishes in the wetlands and allied mosquito larval habitats in different parts of the country is suggested, impact of the alternative prey may affect the successful regulation of mosquitoes. Assessment of appropriate predator-prey ratio under natural habitat conditions is recommended to enhance successful mosquito control by these fishes. Background & objectives: In Egypt, Phlebotomus papatasi is the main vector of cutaneous leishmaniasis. In nature, P. papatasi feeds on blood from different hosts and sucrose (other sugars) mainly from fig fruits. The aim of this study was to examine the effects of three food regimes on the life table parameters of females mainly the life expectancy as a factor determining the fly's capability for Leishmania transmission. Methods: Females maintained on different diets (30% sucrose solution, Guinea pig blood and sucrose followed by blood) under laboratory conditions were observed for offspring emergence to examine the survival period expressed as the median emergence time (E50) and female fecundity (females/female). Life table was constructed including the mean life expectancy at emergence (e0) as a measure of longevity and the mortality rate per day (qx). Results: Females fed on sucrose-blood has the highest fecundity and the shortest E50 compared to those fed on other diets. The mean life expectancy at emergence (e0) differed significantly with the highest value being for females fed on sucrose. Interpretation & conclusion: The calculated expectancies for female life beyond the infective age (8 days) indicated that more flies would survive to become infective when fed on sucrose-blood meals than those offered blood alone which increases its capability for Leishmania transmission. Objective: We hypothesize that upper gastrointestinal symptoms in cerebral malaria are due to gastric motor dysfunction. But gastric motility studies in cerebral malaria are scarce. Methods: We determined gastric emptying half-time (GET½) of liquid meals quantitatively by radio isotope scintigraphy in 25 patients of cerebral malaria and 10 healthy controls. Results: GET½ was prolonged (46.5 ± 4.8 min) significantly (p <0.001) in patients of cerebral malaria compared to healthy controls (27.6 ± 5.3 min). Background & objectives: Malaria prevention relies heavily on insecticide-treated bednets. Even though the benefits of bednets have been proven that in most of the studies carried out in Africa, their efficacy remains dependent on local conditions. In this study, under field conditions, we evaluated the efficacy of two LLINs (PermaNet® vs Interceptor®) and two bednet treatment kits (K-O TAB® vs Fendona 6SC®) against Anopheles gambiae s.l. Methods: Bednets were evaluated using experimental huts in the village of Pissy located in the Saponé health district of Burkina Faso. Treatments and sleepers were randomly rotated between huts. Results are expressed in terms of induced exophily, mortality after 24 h and blood-feeding inhibition. Results: A total of 1392 An. gambiae s.l. mosquitoes were collected during 120 nights in the experimental huts. The overall mortality rates were 85.4% (CL: 79.7–91.4) and 77.5% (CL: 56.9–97.3) for PermaNet® and Interceptor®, respectively. For the conventionally treated bednets, the mortality was 78.2% (CL: 63.13–96.7) with the Fendona 6SC®-treated nets and 75.5% (CL: 61.2–93) with the K-O TAB®-treated nets. The proportion of blood-fed mosquitoes was significantly higher in the untreated bednet arm than in the treated one, as well as for long-lasting nets than for conventionally treated nets. The entry rate did not vary significantly according to the bednet type, but the treated bednets increased the level of exophily by at least 43%. Conclusion: In the field, the Fendona 6SC® kit and the Interceptor bednets showed comparable efficacy to the already used K-O TAB® kit and PermaNet® bednets. These results could help National Malaria Program managers to formulate appropriate policy for effective vector control. Background & objectives: The burden of visceral leishmaniasis (VL) in Nepal, as in other developing countries, falls disproportionately upon the rural poor. Promoting use of outpatient (OP) care, an alternative to inpatient (IP) care has long been advocated to reduce cost of care in both the demand and supply sides as substitution of relatively cheaper resources for expensive resources in the production of health care services. The paper aims to assess the intensity of demand for VL care and explore possibilities of the substitutability or complementation patterns between OP care and IP care of VL. Methods: In order to explore the possibility of substitute (or complement) of OP care for IP care, we exploited the ordinary least squared method by utilizing recently collected data from the VL endemic districts of Nepal. The sample size represented >25% of the population of VL of the country. The paper measured the sensitivity analysis of demand for OP and IP cares using appropriate demand models. Results: The coefficients of demand models gave negative relationship between quantity demanded for health care and their prices. It is plausible that OP price has strong power than IP price to determine the respective quantity demanded for health care. As expected, income has negative sign, but not significant that means income has no effect on determining the demand for health care because VL is a disease of poor. Conclusion: Recently, improvements in treatment and diagnostic techniques suggest a substitute of OP care for IP care; however, the OP and IP cares are complements due to behavioural factors. Background & objectives: Cutaneous leishmaniasis is an infection caused by protozoan genus Leishmania. Although glucantime is commonly used for the treatment of leishmaniasis, it has some side effects including increased liver enzymes and electrocardiogram changes. In addition, the drug is expensive, the injection is painful, and research shows that resistance of parasite to glucantime is growing in different parts of the world. Therefore, scientists are paying more attention to develop new drugs such as nanosilver solution. The present study is an attempt to evaluate the in vivo topical effects of different concentrations of nanosilver solution in the treatment of leishmaniasis lesions. Methods: In all, 90 female Balb/c mice aged 6–8 wk were infected with 2×106 viable stationary-phase promastigotes in the base of tail. Different concentrations (60, 80, 120, 130 and 2000 ppm) nanosilver solution were used in the present study to test the efficacy in the treatment of lesions. Clinical control of the infection trends was conducted weekly for 5 wk by measuring lesion diameter with standard Kulis-Vernieh. Data were analyzed by paired t-test, analysis of variance (ANOVA), and Tukey test. Results: Mean lesion diameter pre- and post-treatment did not significantly differ between different treatment groups (p >0.05). Likewise, a significant difference in splenic parasite load was also not observed between different treatment groups. Interpretation & conclusion: Based on our results, different concentrations of nanosilver are ineffective in reducing mean sizes of lesions. Background & objectives: Phlebotomus argentipes is the vector for visceral leishmaniasis in India. The development of resistance in kala-azar vector to DDT has been reported from various parts of India. The main objective of this study was to generate information on insecticides susceptibility status of P. argentipes to DDT, malathion and deltamethrin in different parts in three states of India. Methods: Phlebotomus argentipes were collected from different villages, identified and used to investigate the susceptibility status against DDT, malathion and deltamethrin as per the WHO standard methods. Results: Phlebotomus argentipes was resistant to DDT in different areas, viz. PHCs Murumgaon in Maharashtra; Ramgarh in Jharkhand; Kodah, Falka, Mahua and Lalganj in Bihar. In Phulwari Shareef PHC of Patna district in Bihar, DDT produced 89% mortality in P. argentipes, indicating resistant/tolerance (verification required) to DDT. The corrected percent mortality to malathion (5%) in different areas ranged between 98 and 100%; and to deltamethrin (0.05%) between 98.4 and 100%. The results showed that the tested P. argentipes are susceptible to malathion and deltamethrin. Conclusion: Phlebotomus argentipes are still susceptible to malathion and deltamethrin, but resistant to DDT. The susceptibility status of P. argentipes should be monitored regularly in diversified situations to ascertain the judicious use of insecticides being used for indoor residual spraying in the programme for rational use of appropriate insecticide. Background & objectives: Wolbachia are common intracellular bacteria that are found in arthropods and nematodes. These endosymbionts are transmitted vertically through host eggs and alter host biology in diverse ways, including the induction of reproductive manipulations, such as feminization, parthenogenesis, male killing and sperm-egg incompatibility. Since they can also move horizontally across species boundaries, Wolbachia is gaining importance in recent days as it could be used as a biological control agent to control vector mosquitoes or for paratransgenic approaches. However, the study of Wolbachia requires sophisticated techniques such as PCR and cell culture facilities which cannot be affordable for many laboratories where the diseases transmitted by arthropod vectors are common. Hence, it would be beneficial to develop a simple method to detect the presence of Wolbachia in arthropods. Method: In this study, we described a method of staining Wolbachia endobacteria, present in the reproductive tissues of mosquitoes. The reliability of this method was compared with Gram staining and PCR based detection. Results: The microscopic observation of the Gimenez stained smear prepared from the teased ovary of wild caught and Wolbachia (+) Cx. quinquefasciatus revealed the presence of pink coloured pleomorphic cells of Wolbachia ranging from cocci, comma shaped cells to bacillus and chain forms. The ovaries of Wolbachia (–) cured mosquito did not show any cell. Although Gram's staining is a reliable differential staining for the other bacteria, the bacterial cells in the smears from the ovaries of wild caught mosquitoes did not take the stain properly and the cells were not clearly visible. The PCR amplified product from the pooled remains of wild caught and Wolbachia (+) Cx. quinquefasciatus showed clear banding, whereas, no banding was observed for the negative control (distilled water) and Wolbachia (–) Cx. quinquefasciatus. Interpretation & conclusion: The Gimenez staining technique applied, could be used to detect the members of the endobacteria Wolbachia easily, even in a simple laboratory without any special facilities or even in the field condition and for handling large number of samples in a shorter duration. Objective: Studies on concurrent infection of dengue and malaria are uncommon in India. Therefore, in this study, we compared the clinical features and outcome of concurrent infection with mono-infection of dengue and malaria. Methods: All the patients of fever within 7 days duration were investigated for dengue, malaria and other causes of fever. Patients of concurrent dengue and malaria (Group A) were compared with dengue mono-infection (Group B) and malaria mono-infection (Group C). Biochemical and haematological investigations were done and compared. Results: During the study period 367 patients of dengue were admitted. Concurrent infection of dengue and malaria was found in 27 (7.4%) patients. There were 27 (5.8), 340 (72.5), and 102 (21.7%) patients in Groups A, B, and C respectively. The clinical features of concurrent infection were more like dengue than malaria. Unlike malaria the outcome of concurrent infection is good. Conclusion: Concurrent infection of dengue and malaria is not uncommon. For the diagnosis investigations for both the infections should be carried out routinely.